Another UX lesson from our daily life: use clear, recognisable visual aids - Harold Tor. The above picture indicates how a bad user experience costs time and money for the driver and for the city administration. The centre of the city of Ghent in Belgium is full of historical monuments and is therefore a large traffic-free zone. In order to allow public transport vehicles to pass through, such as trams and buses, several entry points to the traffic-free zones have varying success in preventing non-suspecting drivers from driving into the zone. In both images, cars have to turn left at the junction. In the image on the left, virtually all cars turn left as advised by the signs. 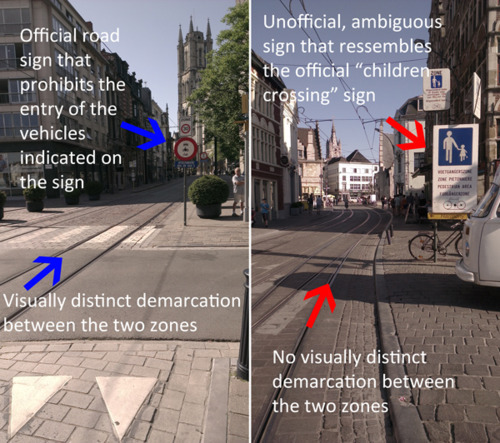 The reason being two: the road sign is an official sign that is recognizable in all EU countries. Secondly, the road within the traffic-free zone is made of cobblestones, so visually, the driver can already see that it is a separate zone. In the image on the right, you can see that these two visual aids were not employed. The city spent money on an extra-large, non-recognizable sign to indicate the traffic-free zone. But drivers easily confuse it with another road sign that is placed in school zones to indicate there are children around. Also, it is not immediately apparent to the driver that beyond that big sign is a separate zone, because the roads look exactly the same. Therefore the success of the entry point on the right is very low. Policemen often have to be stationed in this area to advise drivers from entering the zone, costing more money to the city.